This burlap drum shade wall lamp is a plug-in design for fast and easy installation, with no electrical wiring needed. The wire cage detail surrounds a burlap shade in this stylish swing arm design. The bronze finish starts at the back plate and extends to the arm. A full range dimmer on the backplate allows you to adjust the light as you see fit. 14" high overall. Extends 22 1/2" from the wall. Backplate is 8" high x 3 1/2" wide. Shade is 12" wide x 6" high. 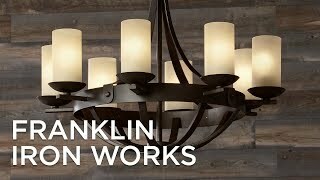 Plug-in swing arm wall lamp from Franklin Iron Works - no electrical wiring needed. Bronze finish over metal construction. Burlap drum shade with wire cage accent. Looks perfect for our. Eclectic mid century modern decor. Artsy without having to have an end table with a light. I like the style and features; switch on lamp, dimmer switch, etc. I hope they look as nice in our bedroom as they look online! Looked very pretty, unique and thought it would look good in bedroom. The burlap fits my 'Artisan Craft' decor and bronze color matches ceiling fan in that room. Matches decor. Unigue design. Simplicity of installation. I have problems with my eyes and I cannot read at night with just a 60 watt bulb. Can I use a 75 watt bulb in this? If not is there any way to remedy this? Thank you! Thank you so much Randy 'cause I love these lamps! How is this affixed to the wall? BEST ANSWER: Hi Leona...there is a mounting plate that you drill four holes for...using wall anchors to help support it. It comes with plastic anchors, but I used much heavier duty ones, as I felt the lamp is a bit heavy for what was furnished. Can this lamp be hard wired in? BEST ANSWER: Hi – these are designed and best used as a plug-in wall lamp. But you may consult a qualified electrician on your conversion to hardwire. Will one lamp be enough lighting for a room? BEST ANSWER: Depending on where you plan on using them and if there are other light sources in the room, one or two maybe just fine. My room is relatively small (12x20) and it provides only ambient lighting. It is just a 60 watt bulb maximum, so not really enough wattage for a light to work by. You can, however, read by it if sitting next to where the lamp is placed. Can I purchase the shade cover separately? BEST ANSWER: Unfortunately, we do not offer the replacement shade nor cage as a replacement part. what is the depth of this wall lamp when it is in it's completely recessed position? BEST ANSWER: No, the backplate does not need to be recessed in the wall. It is a plug-in fixture. Can i order a cord cover? BEST ANSWER: Yes there are plenty of option to choose fro, here is our link to the cord covers. Does it switch off on the base/backplate? I want to buy 2 for reading lamps on either side of the bed. BEST ANSWER: Hi Beth - Yes, there is a full range dimmer switch located on the backplate. You can see in the pictures, it's the little round knob on the backplate. does it come with cord covers? BEST ANSWER: I ordered the cord cover separately. Can the shade part be swapped out for a different color? BEST ANSWER: I'm sorry, this shade is specifically designed for this lamp and there are no other shade options offered with this lamp. These wall lamps are simple beautiful and perfect for what they are meant to do. I love the profile, and rustic but modern look. Beautiful as the picture. It hasn’t been installed, however it doesn’t appear complicated. We have 2) similar swing arm lamps in another bedroom and we love them. Great for small rooms. This lamp is exactly as shown. It's dimmable switch and swing arm makes it great for use in the bedroom. I purchased 2, one for each side of the bed so each person can control their light intensity. Wonderful quality, great design, pleasantly surprised that it had a dimmer switch. Love my new lamp. Mounted by my headboard. Perfect in every way. A little smaller than expected once we installed it.